we have been investigating memory leaks in our app. So far we have always used FastMM4 for this. We have FastMM4 configured so that leaks are written to a log file. Then I remembered that madExcept can also report leaks so I decided to give it a shot. To test, I added a Memory Leak to our App. I added the leak to the method MatClipperPolygon.TClipperPolygon.Clip. madExcept does detect the leak, which is just great! However there is a difference in the callstack when compared to the callstack listing that I get from FastMM4. I added the exception to Core.bpl which is used by our App.exe. 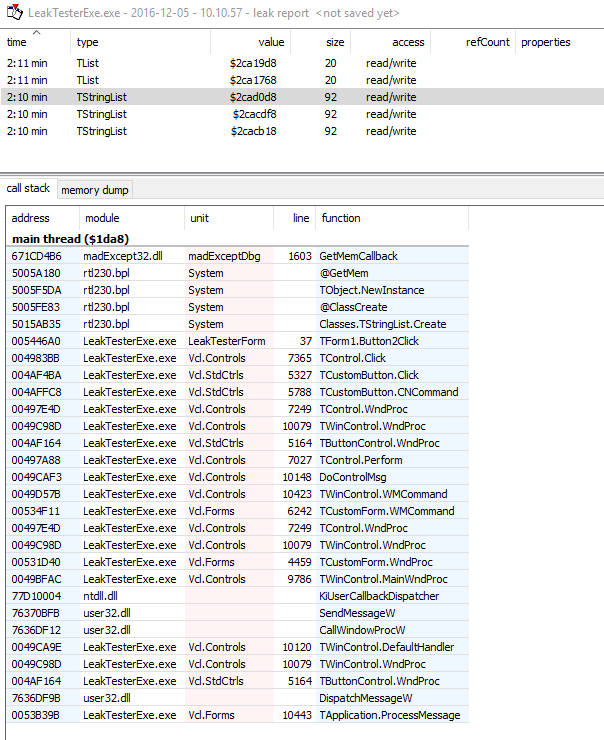 Below is an extract from the FastMM4 log file, it points to the line where the memory leak ocurred. Very useful. Further below is a screenshot of the madExcept Leak Report. You will notice that the callstack is missing info from Core.bpl, which is where the memory leak ocurred. It is picking up other bpl's along the way though. Any idea why this happens. From what I read madExcept relies on FastMM4 for detecting memory leaks. 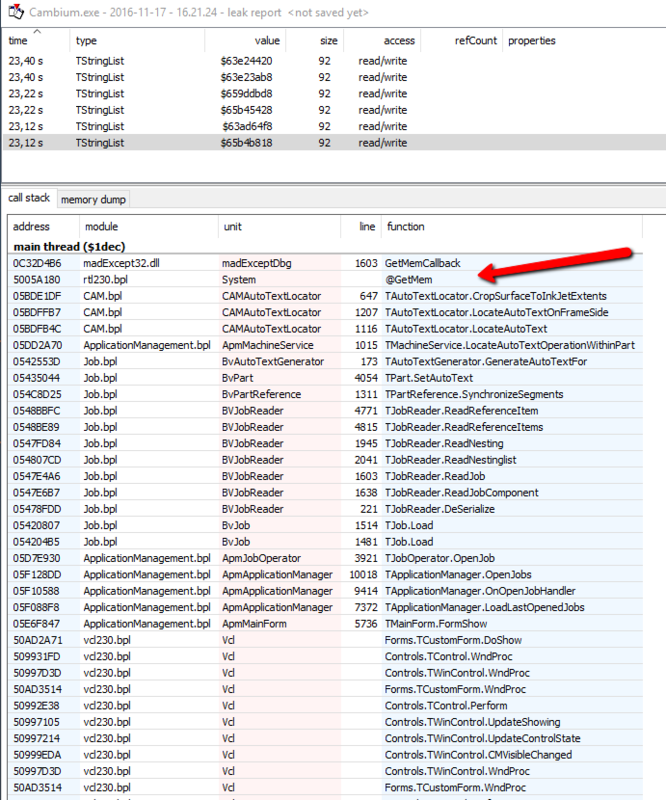 It would be great if the callstack retrieved by madExcept included the function where the memory leak orginated. madExcept does not rely on FastMM4 for anything. madExcept's leak detection is a completely different/separate solution. Is there an easy way for me to reproduce the problem on my PC? In my tests the callstacks usually seem to be complete. When you run the exe you will see a form with two buttons. Button2 leaks a TStringList in the LeakTesterLib (bpl). Press each button at least once, then shut down the app. The madExcept Leak report will appear. The report for the leak in the exe file is fine (Button 1). However the report for the TStringList could be better (Button 2). But this unit/function is not shown at all in the callstack.